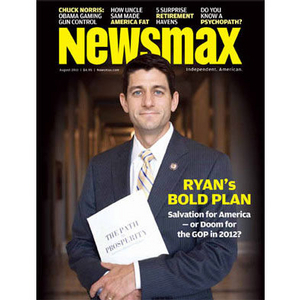 Ryan's Bold Plan: Will It Save America or Kill the GOP in 2012? Will it spell salvation for America — or doom for the GOP in the 2012 elections? The Wisconsin Republican, chairman of the House Budget Committee, has proposed a complete overhaul of Washington's spending in a budget plan, The Path to Prosperity, designed to rein in skyrocketing federal debt. In an exclusive interview with Ryan, Newsmax explores how the Ryan plan may bring includes fundamental changes to the "third rail" of American politics, Medicare, but accomplishes something President Barack Obama has failed at time and again — taking the lead on an issue of vital national importance. Newsmax magazine's special report "Ryan's Bold Plan" includes an intensive look at the Ryan Medicare proposal, his full fiscal reform plan and its political repercussions. This issue of Newsmax magazine also features a must-read report from award-winning science writer Gary Taube: How Uncle Sam and conventional medicine made America fat. The news that sparked a GOP "mini rebellion"
Ryan: Obama's budget speech "pure demagoguery"
No end in sight for "eternally jobless"